Our clients are where they are today because of hard work and a commitment to investment in themselves. Often times that means our clients are, or have been, business owners. They understand how to identify value in the market place and they understand what it means to take risk. When they consider their investment portfolio, they are often interested in identifying new and innovative ways to add value to their portfolio. They understand the value of liquid, marketable securities, but for a portion of their portfolio they want to engage more creative strategies to take advantages they see in the marketplace. That’s where John Galt Wealth Solutions Non-Standard Asset (NSA) Platform fits in. We work with experts throughout the NSA industry to identify opportunities for investors that they wouldn’t find elsewhere. This can include a multitude of different direct investment options in programs like real estate, oil & gas, venture capital, equipment leasing, etc. As with any investment opportunity, there are strengths and weaknesses associated with utilizing non-standard investments in a client’s portfolio. Typically these investments are limited to high net worth, accredited investors who have the ability to understand the intricacies of these programs. When utilized in a prudent manner, we believe these assets can provide a special touch that investors can’t find elsewhere. The basis for any well managed retirement portfolio is a strong strategy in the equities and fixed income markets. If an investor is simply looking for a portfolio that mirrors the stock market, simply buying an index fund may be an option. 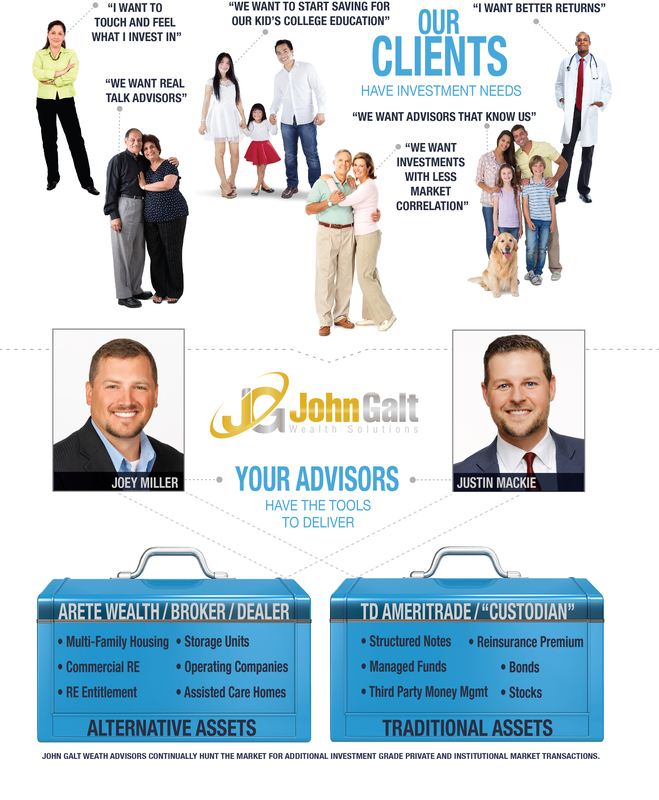 However, for those clients that are seeking a personalized and attentive platform in stocks and bonds, John Galt Wealth Solutions provides our Fee-Based Managed Portfolios. As an independent firm, we have a wide variety of strategies we can bring to bear for our clients. Be it managed mutual fund portfolios, focused equity strategies, income and risk management funds or managed bond funds, John Galt wealth Solutions brings our network of professionals to the table on your behalf. As the world changes, so will the options John Galt Wealth Solutions brings to the table. Instead of the standard “buy, hold and pray” approach to investing, we’ll work on your behalf to make sure your portfolio is positioned for the environment we face. There are those who are hands off investors and then there are those who wish to be active in their portfolio. We cater to those who are active investors, those that want to know more about where and how their money is working for them. Those that enjoy making decisions about how their portfolio is allocated, about the companies they invest in and the faces behind the company name. In many instances our investors get to physically meet the people who they invest in, ask them questions personally and see for themselves the projects their investments help fund. For these investors we act as their due diligence team. We are on the road and in the circles to source for you the very best opportunities the market has to bear. For the accredited we open up the possibility to a world of private placements and alternative asset funds. These markets include medical, real estate, wineries and oil and gas to name a few. Very few people find themselves ready for retirement with a nest egg to manage or in their working years growing that nest egg without years and years of hard work, discipline and determination behind them to create all that is now before them. The partners of John Galt Wealth Solutions know this first hand, both growing up in a blue collar town, born to good hard working families. They did the same both working in humble industries before becoming accomplished wealth advisors. At John Galt Wealth Solutions your nest egg is not just another number to be allocated. We understand what went into achieving the level of success you have today and the weight that caring for and growing your nest egg carries. In a sea of numbers we stand out by investing for you, we understand the sleep at night factor when considering investments. It is our mission to help you invest in things that are not only beneficial to your bottom line, but investments that you believe in, understand and feel good about being a part of.